HopTheLine is online service provides you instant pass purchasing of worldwide upcoming & ongoing event in more secure manner. 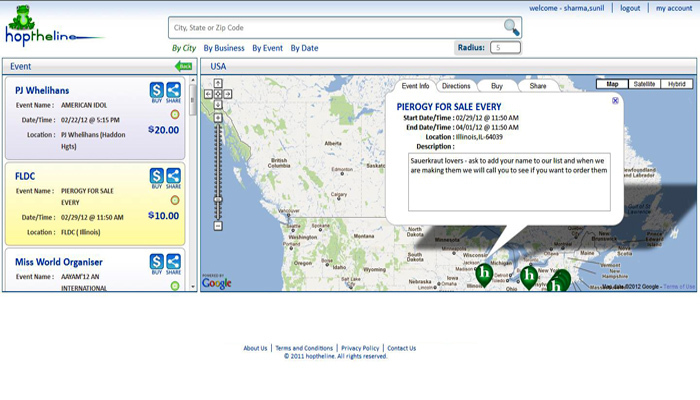 HopTheLine connects businesses to customers in real-time. It provides facility to create, share, join of your own events. It provides you to search events according to your interest. 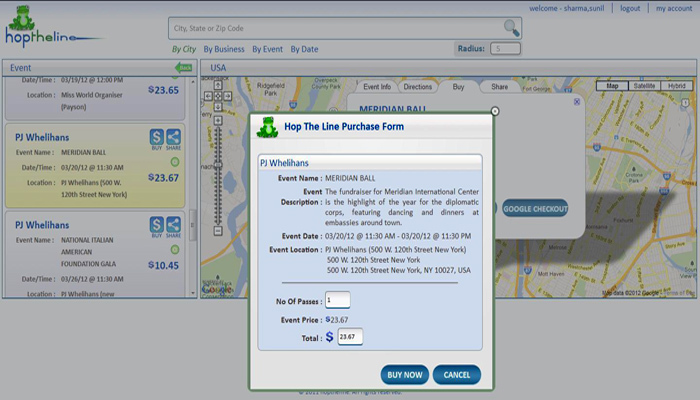 HopTheLine is benefical for both event organizers and buyers. You can share your interests, events using popular social network such as twitter, facebook etc. HopTheLine app is also available for iPhone and Android phone. So no need to access your laptop or computer, get pass anywhere anytime by tapping some fingers. Your customers hate waiting in line, Use HopTheLine. HopTheLine provides you to connect & share with social network such as facebook and twitter to share your events automatically with your valuable users. There are many people willing to pay a premium to get into your bar, onto your golf course, a seat at your table or for like we said be creative. Your followers deserve some VIP opportunities! How your customers reach the event place?? 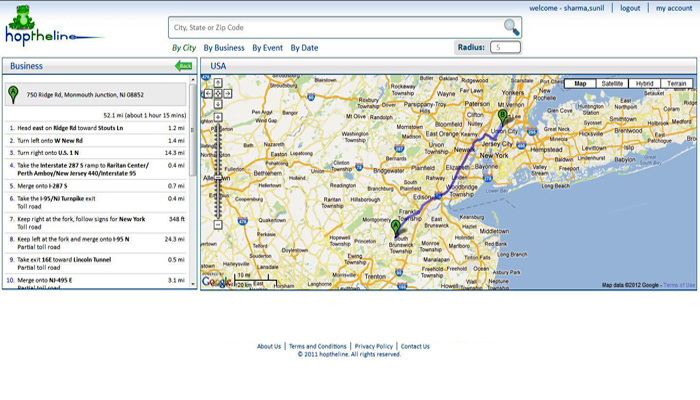 HopTheLine integrate google maps so that customers can easily find place and direction to or from any place. They are only a click away once they reach your event details page. 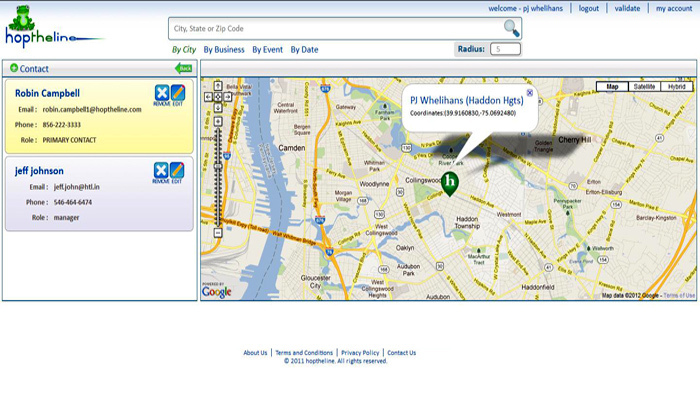 We offer an additional convenience for GPS enabled devices by auto-populating the current location. The host of the event need only to enter the code into our secure validation page and we'll give the go-ahead. Customer also dont need to take any ticket to the place, show secure pass code or QRCode and get entry. 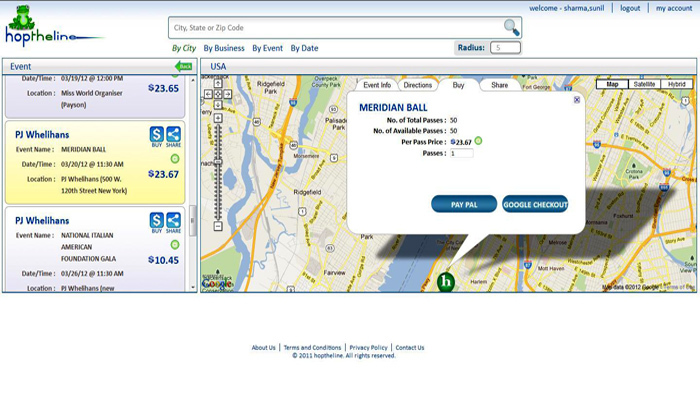 Need instant access to a restaurant, bar, night-club or event! Why wait? 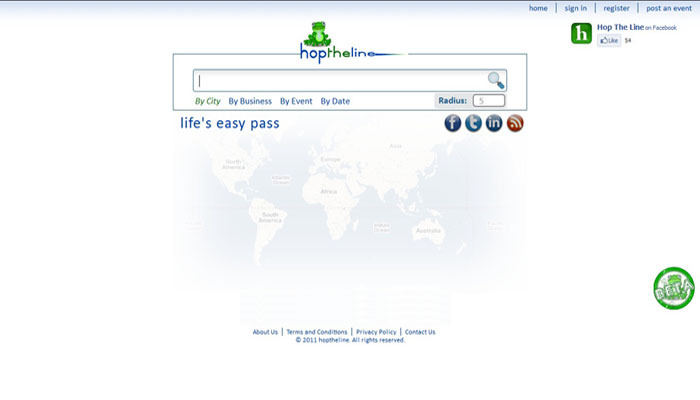 HopTheLine helps you find your way in the door right now! Using our map based search from an internet browser or mobile phone, you can locate and buy a pass to that favorite hotspot. whenver you parchase any event pass, you can share & invite your friends to join you. By following your likes through your preferred social media outlets, you will be alerted of opportunities to HopTheLine! HopTheLine provides you a single click facility to reach at your event place or where you are currently standing and instantly receive directions. Purchase, share, turn by turn directions. Don't worry about your debit cards. We provide you secure payment functionality to purchase pass using PayPal & Google Checkout from anywhere. Now you can safely purchase pass and get secure code instantly or in your mailbox. HopTheLine is online service provides you instant pass purchasing of worldwide upcoming & ongoing event in more secure manner. 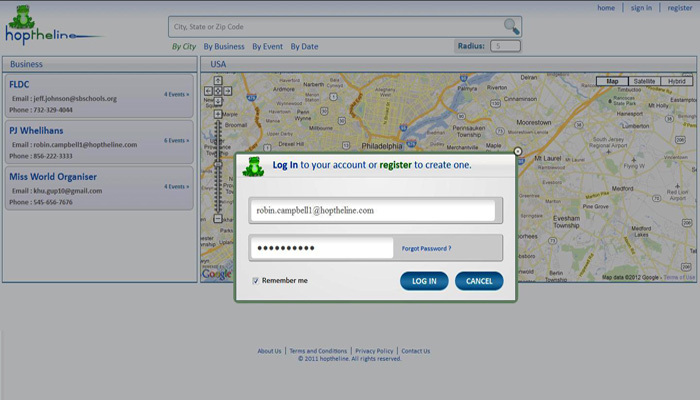 Business or member can login using unique email id and password. After user login, My account provides all the features from user can perform many task according to their access level. In events business can generate events and member can view different events worldwide of different business. Here member can see how many pass available and price of them and can start purchasing. Purchase form display complete information about the event and purchasing details. 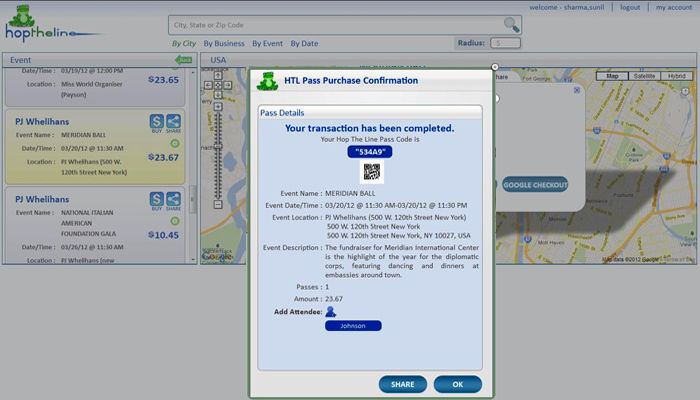 Purchase confirmation gives member the receipt of purchased pass with unique pass code with qrcode. 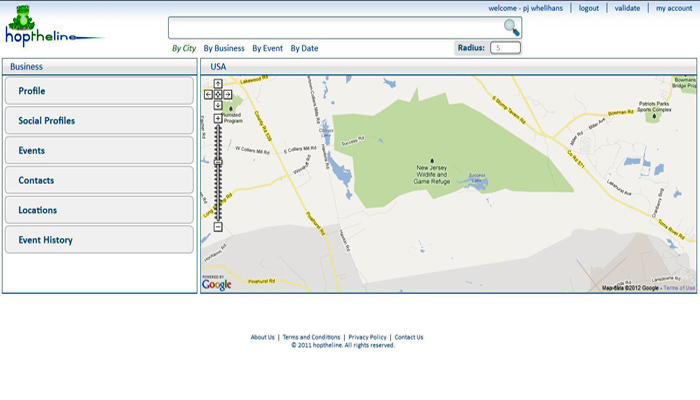 Direction panel gives member direction from or to a specified location to the event location. Directions gives member the direction step by step with total time and distance. For member in contact panel business contact person details given so that they can contact then. HopTheLine is online service provides you instant pass purchasing..
Business or member can login using unique email ..
After user login, My account provides all the features from user. .. In events buisness can generate events and member can view. ..
Purchase form display complete information about the event. ..
Purchase confirmation gives member the receipt of purchased pass. .. 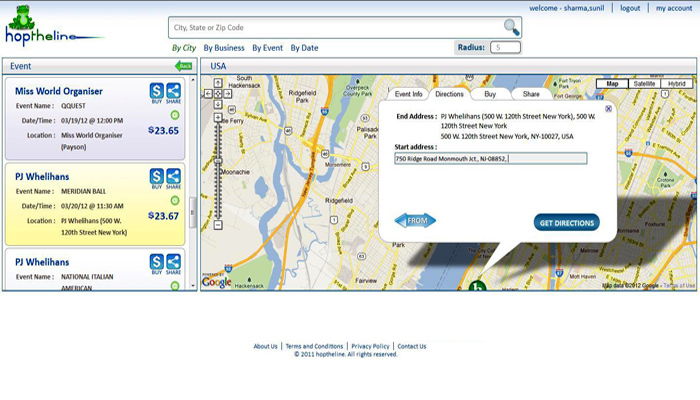 Direction panel gives member direction from or to a specified location. .. Directions gives member the direction step by step with total time . ..
For member in contact panel business contact person details given. ..